Materials: travertine, sand, glass and perfumed essence of anise. Dimensions: m 4,2 x 2,5 x h 3,2. 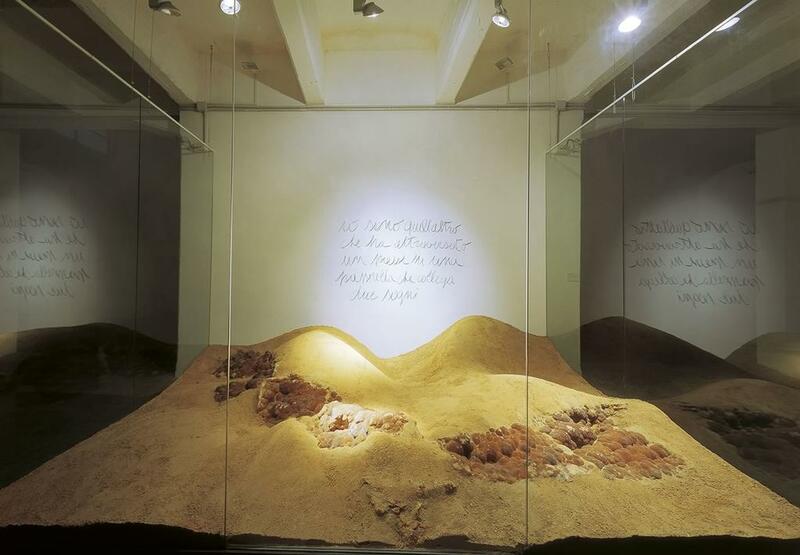 For the exhibition ‘Lavori in corso (Works in Progress)’, organized by the Galleria Comunale di Arte Moderna e Contemporanea in the former Peroni beer factory, Maria Dompè created an intensely poetic work. Around a stone wall inside of a vast and suggestive space, blocks of travertine emerge from a pile of sand blocks that have been chosen and placed in order to reveal an unusual aspect of the stone, somewhat similar to a solidified magma, which evokes the warm colour of amber. Glass isolates and protects the work, while at the same time, the openings in the glass panels allow the perfume of anise to filter into the outer space, giving to the surroundings the special atmosphere of the work. 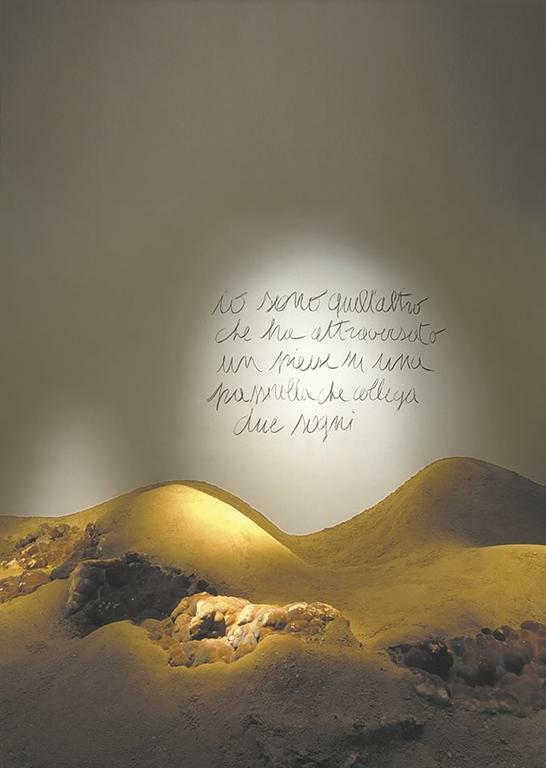 On the white background wall, Dompè has hand written a quotation from the Moroccan writer, Tahar Ben Jelloun: “I am that other who has crossed a country on a gangway that connects two dreams”; the phrase, which is also the title of the work, enters decisively into the spatial organization of the work and introduces a chromatic contrast that emphasizes and sustains the nuances of the sand and the travertine. 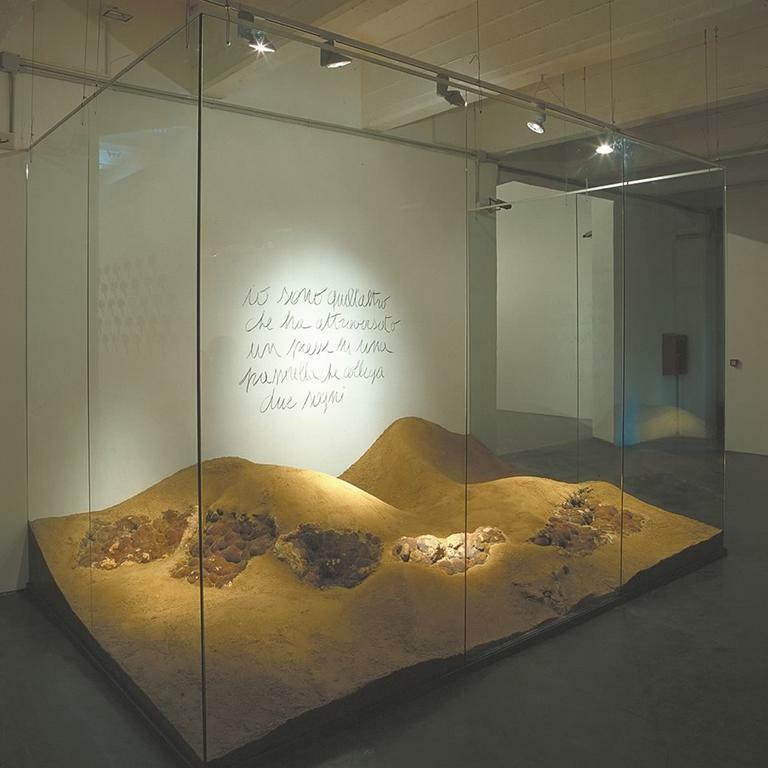 This fascinating verbal evocation, therefore, re-echoes the theme of the work and from inside of the glass-confined space, transparent and impassable threshold, suggests the boundless vastness of desert landscape. All rights to the images are reserved and protected by law. No part of this site may be reproduced, stored or transmitted in any form or by any means, without the written permission of the artist.